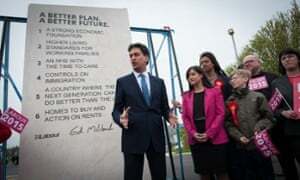 Some members of his team prayed the omission would not be noticed, though at a donor’s party after the speech, two of Miliband’s closest aides – Stewart Wood, who exerted the greatest intellectual influence on the candidate, and Stan Greenberg, one of Miliband’s American pollsters – were heard joking to one another about the missing passage. Miliband was so distraught that he shut himself in his hotel room, where a series of people, including his wife Justine, joined him and tried to offer some reassurance – pointing out that the omission had not featured prominently in the BBC political editor Nick Robinson’s report on the Six O’Clock News. Still, as polling day approached, Lord Falconer, the Labour peer charged by Miliband with preparing the party for the transition to government, was working on three possible electoral outcomes – all three involving a hung parliament. The most pessimistic had Labour with around 260 seats, making it difficult for the Liberal Democrats to reject a second coalition with the Tories. The other two envisioned Miliband as prime minister: one had the Tories on 270 to 285, unable to form a government; the other had Labour with slightly more votes than the Tories, but with slightly fewer, or the same, number of seats. Planning for post-polling-day manoeuvring had been handed to four people: Lord Falconer, Lord Adonis, Miliband’s chief of staff Tim Livsey and Alastair Campbell. The key issue they had to address was the point at which Labour fell so far behind the Tories that Labour would be unable to form a credible minority government. Falconer’s group calculated that if the Tories won more than 290 seats, things would become difficult for Labour. As a result, Falconer was keen to secure a deal with the Lib Dems, which would, he thought, give Labour greater moral legitimacy by providing an extra 25 to 30 seats. Such a coalition would have well over 40% of the popular vote. Falconer undertook highly detailed planning on the transition to power, including proposed concessions to the Lib Dems and bills to be introduced in the first Queen’s speech. On 7 May, hours before the polls closed, Falconer started briefing political editors on how Labour could appeal to the Cabinet Manual to force Cameron from office. 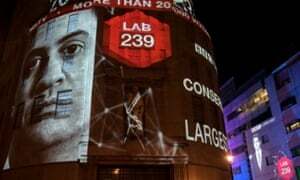 At 9.55pm on election night, in Labour party headquarters at Brewers Green in Westminster, the party felt that it had charted a clear, if perilous, path to power. The battle that night would be whether the Liberal Democrats would choose to partner with Labour or the Conservatives. Then 10 o’clock struck. “There were two TV screens – one on Sky, one on the BBC,” a senior campaign aide said. The first words came in, announcing that the exit poll had found the Tories would be the largest party. “Yep, I was expecting that. Anything else would be a surprise,” the aide recalled thinking at the time. “Then the seats came up. Total silence. The shock was just awful. That exit poll will be seared in my brain for ever.” Bell and Livermore stared at each other in disbelief, as the whole room put their hands to their mouths in shock. Harriet Harman was waiting outside Millbank TV studios to give her initial reaction. None of the scripts she had been given anticipated this disaster. Miliband’s senior advisers huddled for the next hour, trying to decipher the stated results. Miliband had, with his speechwriters, prepared two responses, each different in tone: one if Labour was confident that the Tories had lost, and the other for the possibility of a Conservative – Liberal Democrat – DUP coalition. Neither was needed. Instead, as the real results confirmed the exit poll, the discussion turned to the question of Miliband’s resignation, and whether he should stay on in a caretaker role, as Michael Howard had after the Tory defeat in 2005. Beales argued that it would be more dignified to quit immediately. The party would be unable to have an honest debate about what had gone wrong if he remained. Miliband agreed. When Miliband arrived at Labour headquarters the next morning, Falconer and Harman once again suggested that Miliband might take up a caretaker role. But his wife insisted that it was not the right decision – he should not have to be repeatedly mocked by Tory MPs at prime minister’s questions, she argued. 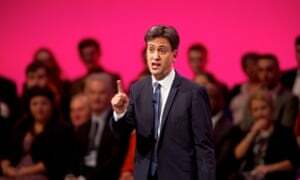 Miliband’s aides say that, looking back, he blames the Labour defeat on the SNP, and the failure of the campaign to inspire hope among certain key voting blocs – known, in the argot of pollsters, as Mosaic groups G and H: middle-class families with small children, and young couples trying to settle down. There were other problems, of course: the highly touted but ultimately ineffective £15m ground campaign; Labour’s difficulty in attracting elderly voters; the party’s wariness to discuss identity or Englishness. But one failure stands out above all. Many Labour figures remain puzzled, and frustrated, by Miliband’s refusal to do more to defend the last Labour government’s economic record. Campbell said that he assumed Miliband was reluctant to do so because he had won the leadership election on the promise of a break with the past. Miliband clearly wanted the election to be about the future – and his vision of a new and more equal Britain. But Labour’s legacy played a role far larger than anyone had expected.